I have had this peplum blouse in my closet for about two years and I cannot tell you how many times I've worn it. The leopard print is bold and quirky, which makes it fun for me to wear. In the photos above, I tucked the blouse in a faux leather skirt to create an illusion of a skinnier waist and I wore my Mary Jane style pumps to give me a little height even if the yellow poles were clearly still taller than me. 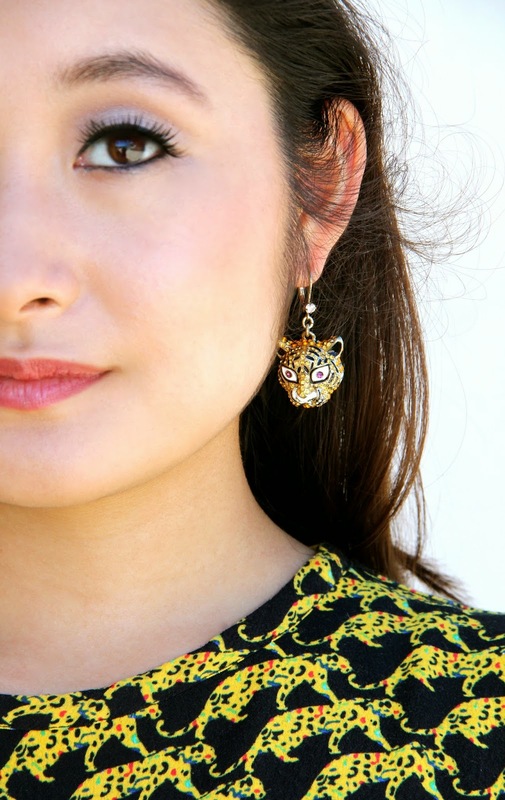 I also wore my tiger earrings to emphasize the cat-like feel to my outfit. To top it all off, I wore gold-toned jewelry and carried a black and gold rectangular clutch. If you live in a colder climate than I do, you can still rock an outfit like this in the fall. All you have to do is wear black tights under your skirt and throw on a jacket or coat to keep you warm. The possibilities are endless! Hope this post inspires you to try to transition some of your summer pieces into fabulous fall outfits. Have fun mixing and matching, and as always, sending you lots of love from my heart to yours! These images are particularly awesome--kudos to model and photographer!